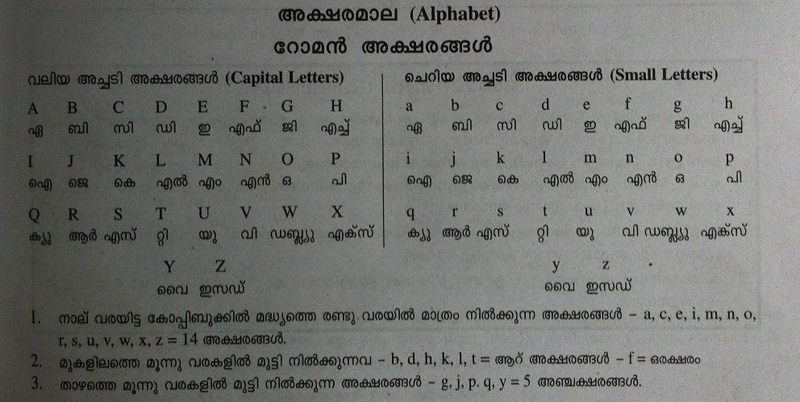 The below grid is a lesson in the book "Rapidex English Speaking Course" that demonstrates how to pronounce English letters though the Malayalam script. I am not an expert in Malayalam Linguistics, but from my limited understanding, I would guess this chart is written in a way to reduce the Mother Tongue Influence while spelling letters in Spoken English. L, M, N, S - When many Malayalees (Tamils, too) spell English words with these letters, they may say "yel," "yem," "yen," and "yes." This chart doesn't spell the "y" before these letters, but a short "e" sound which would be typical of native speakers. Z - This transliteration may say "zed" which works well for British spelling. For American spelling, we need to say "Zee" (as in Zee TV). The other thing to keep in mind is that Z needs to be a vibrated sound, where as s is not vibrated. If you are a Malayalee reading this post, I'd be curious to know if this chart below is familiar to you. Especially if you learned English in a Malayalam medium school, were the transliterations of the letters the same or different? If it is possible to share different transliterations through Malayalam script or images, please try to insert them in the comments below or send them to my e-mail ID at authenticjourneys at gmail dot com. Thank you for your help. Your help will help me to help others better! Click on the photo to see a bigger size.